Format Junkie is an Graphical application which gives you an easy file format manipulation facility on your desktop. The home page of Format Junkie is here . It is available in launch pad so that you can quickly install it on Ubuntu . 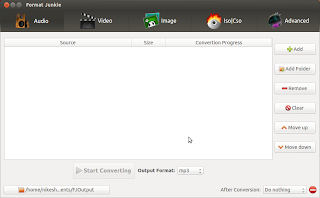 d) Iso|Cso Create an iso with selected files, convert iso to cso and vice versa. e) Advanced Encode subtitles to an avi file. After successful installation, you can open up the application from the Unity 'Dash' Here is a screen shot. Most modern Unix like operating systems (e.g. Linux, MacOS X, and BSD) come with ( or can be installed ) a little console-mode utility called GNU Screen. Even some of the power user who work exclusively on console are unaware of its existence. Start screen just by typing screen at your favourite command shell prompt. You'll probably be greeted by a welcome message. Dismiss this and you'll have with an empty terminal containing a shell prompt, which is pretty much what you had before you started screen. Every program running under screen runs in a window, and every window is identified by a unique number. Screen made a new window, numbered it 0, and started a command shell inside it. Let us run ls command in this window or any other command so that we can recognise the window later on. Now make another window; this will be window 1.
. To switch between windows , type C-a C-a, which will switch you to whichever window you were using before the current one. Here are some more window switching key sequences if you have many windows open under screen. Use C-a n and C-a p to switch to the next or previous window in the list, by number. Use C-a N, where N is a number from 0 to 9, to switch to the corresponding window. Use C-a " to get a full-screen list of windows. You can navigate this list with the arrow keys (or vi-style, with j and k), and pick a window to activate by pressing Enter when it's highlighted. C-a w will give you a small, non-interactive list of windows. A window can be given a name if you type C-a A This name will be used in the window listing, and will help you remember what you're doing in each window when you start using a lot of windows. Exiting the last program in a window will cause the window to disappear. You can also kill misbehaving programs with C-a K.
You can detach from the screen session by pressing C-a d. This means the screen session will be decoupled from the terminal in which you started it up. If you close the terminal in which screen is running , the session will be automatically detached. Detaching a screen session does not terminate any of the programs running in that screen session . Start up a new terminal emulator, and type screen -r . You'll be right back where you were when you detached. You can detach from a screen session at work, shell into the machine from home, and reattach. Screen remembers a configurable number of scrollback lines, and you'll need them because you won't be able to use your terminal emulator's scroll features while running screen. You can access the scrollback buffer by entering "copy mode", which is accomplished by typing C-a [. You can mark text anywhere in the scrollback buffer and paste it with C-a ]. One of the disadvantages of running a bunch of programs within screen is that you can't keep an eye on all of them at the same time, since in general you can only see one at once. ) To help mitigate this problem, Screen has features that allow you to monitor a window for silence--useful for knowing when a compile has finished, for example--or activity--useful for knowing when someone is finally talking on your favourite IRC channel, for example. To start or stop monitoring the current window for 30 seconds of silence, type C-a _; to start or stop monitoring a window for activity, type C-a M.
Screen looks for a startup configuration file named .screenrc in your home directory. Look in screen man pages for options. Gmote is a powerful program which allows your anddroid phone to act as a remote control for your Linux desktop. Gmote provides all standard remote control features such as play, pause, rewind, volume controls etc. Gmote can also be used as a wireless Touchpad and keyboard, allowing you to control your computer at distance. Gmote has the ability to stream music from your computer to your phone! Gmote has to be set up both on your computer and on your android phone. The Gmote Server requires the Java JVM version 1.6 or higher. To determine your java version, go to terminal and type 'java -version'. On starting you'll see a password prompt. This allows you to set a password so that only you can connect to the server from your phone. You'll be asked to enter this password once on the phone as well. You can change your password later by right clicking on the Gmote server icon (task bar) and selecting 'Change password'. Finally Gmore server will get started on port 8889, make sure to adjust your firewall rules accordingly to allow connection on port 8889. The installation process for client is fairly simple. From your Android handset, download and install the Gmote client. You need wifi or 3G connectivity between your phone and PC. Launch Gmote from your phone, select the server to connect to, and enjoy. GRUB 2 is the next generation of GNU GRUB. All recent versions of ubuntu come with GRUB 2. GRUB 2 cleaner, safer, more robust, more portable and more powerful. If you're already familiar with older GRUB, GRUB 2 configuration file is similar in broad sense, but it varies in many finer details. Some times it can be a bit tricky too. To change the default timeout option in GRUB 2, you just need to change the GRUB_TIMEOUT parameter. The value of this parameter is in sec, change this value as per your requirement. The easiest way to lock a user account on Linux machines is to use -l option to passwd command. The easiest way to get most of the media format working on ubuntu 12.04 is to enable medibuntu repository and install couple of extra packages. This can be done quickly as follows. I was browsing through Ubuntu forums when I saw this list of dangerous commands. I am copying them for my own reference. Don't try them out. 1) Delete all files, delete current directory, and delete visible files in current directory. This post is targeted at those Linux users behind a network proxy but cannot set it in an app, or are just plain lazy to go about telling every app to use a proxy. I’ll give a quick rundown of the instructions for those in haste, with geeky details following towards the end. I’m assuming a fairly recent distro here, and I’m targeting the Ubuntu 12.04 release. On Ubuntu, we have another package that we’ll need, iptables-persistent. But before we install it, let’s set some rules (iptables rules.) Don’t worry, it’s nothing but a bunch a lines in a text file. Now we shall install the package iptables-persitent. During the installation, it will ask you whether you want to save the current rules. Yes, you do. The redirection’s been set-up. Time to get the juicer running. Voila! You have the ultimate solution to proxy! You may (or may-not) set a proxy in Gnome, Firefox, wget, gedit, whatever; it will work. This will not interfere with what you have set in Chrome/Firefox/whatever. In fact, I recommend that you explicitly set a proxy wherever you can. You see, redsocks has a knack of getting in a bundle sometimes (too many pending requests…,) in which case, a simple sudo service redsocks restart should suffice. This also “fixes” those apps which provide no method of setting a proxy whatsoever, e.g, Gwibber. Sadly, unsupported protocols still won’t work. Sorry, no Thunderbird, no torrents, no irc. PS: This is the exact same method used by the Android app ProxyDroid to provide system-wide proxy on rooted Android devices. This note explains how to setup a nis slave server. It is assumed that you have a NIS server running . Install ubuntu 10. 04 Lucid on  gauss  10.107.35.6. Setup the network interface and make sure that it works as a standalone machine. build the database map and how the master will relate to the NIS slave. Edit the make file to allow the master to push maps to the slave. # /etc/defaults/nis    Configuration settings for the NIS daemons. # Are we a NIS server and if so what kind (values: false, slave, master)? On a client machine which is being authenticated by the master edit /etc/yp.conf  and change the  ypserv  entry to point to the new slave machine. Restart nis on that client machine and see if you are able to login.